This past weekend our contributing photographer DJ Sica took us to the New York City bar Fat Cat. 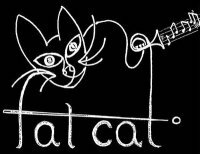 Fat Cat is a place that features live jazz music and offers a wide variety of recreational games like, chess, pool, shuffleboard, and scrabble. The place was packed, and out of 200 or so people playing games not a single group was playing Backgammon. We decided to get a board from behind the bar and start playing. 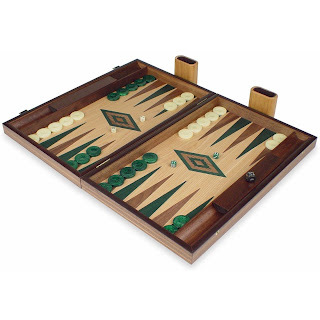 The set that Fat Cat offers to play on was the Mainstreet Classics Backgammon Set , a good little set that sticks to the basics. Within a few minutes people started to show interest. They either didn't know what it was or were in awe of how skilled we are(more likely the former.) 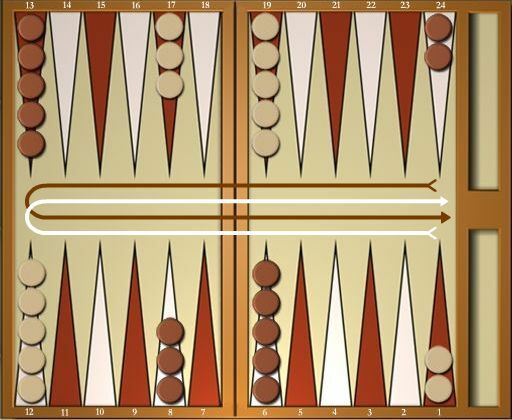 This inspired us to write a featured article about the extremely underrated, and fun pas-time, backgammon. 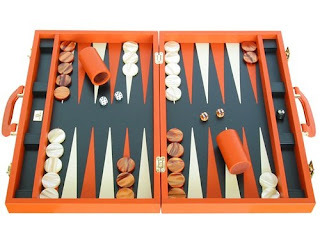 Variations of Backgammon date back to 3000 B.C. in Persia(ancient Iran) making it one of the oldest class of board games ever. 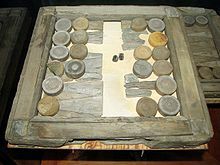 It's part of a huge family of games throughout history, where the roll of dice determines the fate of the players or the moves of the pieces on the board. The variation that we use today for backgammon was first seen in the 15th to 17th century. The photo to the left is a board recovered from a 17th century Swedish warship called the Vasa. The game is played by 2 players. First 15 checker like pieces are set in predetermined locations on the board. The winner is the player who moves their 15 pieces off of the board first. During each player's turn they roll 2 dice. The outcome of the roll determines how many spaces you can move any of your pieces. Your pieces are moved in one direction opposite of your opponent's direction, note the arrows in the picture to the right. Each move being determined by a dice roll leaves much of the game to chance causing an equal playing field for most players. There are however strategically more effective ways to use your allotted moves judging from your opponents prior moves, and skill level. This has made it a very competitive game. Causing many players to play for money and in tournament style. 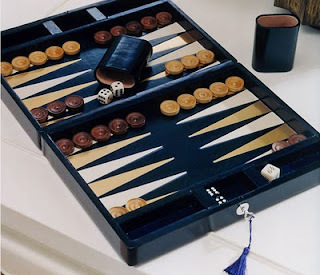 There is even a professional backgammon circuit with tournaments all over the world. Paul Magriel know as X-22 in the backgammon world has won over 50 of the worlds most prestigious backgammon tournaments. He has written articles in the New York Times on the subject. He even gave Prince Nawaf Ibn Abdul Aziz of Saudi Arabia private lessons. He wrote what many consider to be the Bible of backgammon the book simply titled Backgammon . Bill Robertie graduated Harvard and is one of three players to have won the Monte Carlo World Backgammon Championship twice. he also helped publish the best selling Poker strategy book with Dan Harrington titled Harrington on Hold 'em .